In a medium mixing bowl, combine flour, the 1/2 cup sugar, and the baking powder. Add milk and melted butter; stir until just combined. Spread the batter in a greased 8x8x2-inch baking dish (2-quart square). Scatter blueberries evenly over batter. Sprinkle evenly with the remaining 1/3 cup sugar. Bake the cobbler in a 350 degree F oven for 40 to 45 minutes or until a toothpick inserted into the cake portion near the center comes out clean. 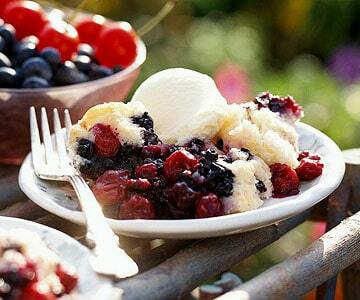 Serve the dessert warm with ice cream or frozen yogurt, if you like. Makes 10 servings.